I have had to tell myself to stop listening to advice that others offer up. Everyone seems to have an opinion on how you should parent. But here’s the thing...you are the parent of your baby, not them. They do not know what life every day with your baby is like. From day one, my baby was a high needs baby, but I had never heard of that term before. She is my first but I still knew she was much more demanding than any of the babies I had been around before. I always just listen to my gut and try to meet her needs. Since she was born, everyone would say not to pick her up too much and say things like, “you don’t want an arm baby” or “remember you are creating habits”. 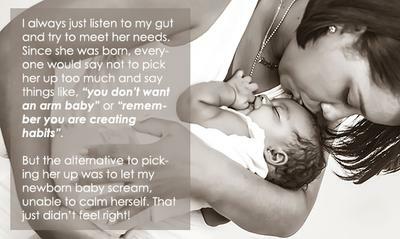 But the alternative to picking her up was to let my newborn baby scream, unable to calm herself. That just didn’t feel right! What felt right then and what feels right still (4 months later) is to pick her up and show her I love her and that she can trust me! Erikson’s stages of development would always pop into my head in the early days, and I would ask myself...do I want to teach her she can trust me or that she has to fend for herself? Those early days are so important and foundational! And I am so glad looking back that I have listened to my gut and not the opinions that were so readily poured out on me! Honestly, everything with my baby has felt so right. Challenging, but right. Like I can just feel that we have such a deep connection and she knows that she is safe and protected always. It is beautiful. But occasionally, I let other people’s opinions get in my head and mess that up. I will have days where I feel like I am doing everything wrong because of the things other people say. That is actually what brought me here today! I was searching for help for my baby that needs constant contact/attention after being told that I really need to put her down more and found “high needs babies”. Everything I have read has reassured me that I am doing the right thing by meeting her needs rather than trying to change her. On days like this, I just have to remind myself that other people’s opinions don’t matter at all and that I know what is best for my baby!